MEDICAL FAIR INDIA, India’s No. 1 Trade Fair for Hospitals, Health Centres and Clinics, impressively continues its rate of growth and keeps pace with the positive trend in the industry. This conclusion can be drawn from the successful course of MEDICAL FAIR INDIA 2018 in Mumbai. 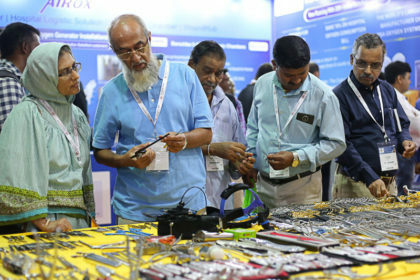 16 – 18 March saw 12,350 trade visitors come to the Bombay Convention & Exhibition Centre to learn from 551 exhibitors about innovations for health care and current trends. Also taking positive stock was the Brazilian manufacturers’ association ABIMO. Karina Yamamoto (Trade Promotion Coordinator) emphasised: “The Indian market is developing at warp speed and it is very important for us to get a foot in the door here and learn to understand the market. In addition to Indian visitors we also succeeded in making contacts in Bangladesh, China and even Saudi Arabia and the United Arab Emirates.” Again, the integral programme components of the trade fair made MEDICAL FAIR INDIA 2018 even more attractive for visitors. 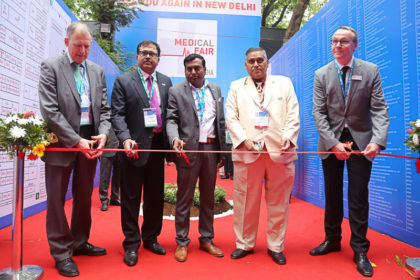 Worth mentioning here is CLIN LAB INDIA, a conference with exhibition organised by Scherago and Messe Düsseldorf India; in terms of content it focuses on molecular diagnostics, point-of-care applications and immune-biological laboratory medicine. The increasing digitalisation of medicine was centre stage at the ‘International Conference on Digital Health and Medical Equipment’ by Voice of Healthcare and the Lounge Area ‘FTR4H’ (Future for Health) played a prominent role within the trade fair as a platform for the creative start-up community. Here the discussions related to presentations and brief lectures revolved around sounding out the market relevance and maturity of innovations and placing young entrepreneurs with potential business partners. MEDICAL FAIR INDIA is a trade fair in the product family MEDICAlliance. It is held by Messe Düsseldorf India, a subsidiary of Messe Düsseldorf, and takes place in close cooperation with the team of Düsseldorf’s leading global trade fair MEDICA. All the facts, figures and information on MEDICAlliance trade fairs are available online at http://www.medicalliance.global.